My mother learned how to send e-mails from her phone...the world may be coming to an end. My whole family lives in Ohio yet seems to be befuddled by the concept of a packet of Cincinnati-style chili mix. I turned on my A/C this morning for the first time this year although it hasn't reached above 78 in my condo. I'm getting it cooled down for the 'rents stay at the Rissy Resort...not everyone shivers in 70-degree temps. Sometimes what you want to do and what you should do are different. I need to be better at putting my foot down. When my kitty stretches out and snuggles with me, she is more than half as tall as me. Two dozen white roses for opening night? Yes, please! Thanks, Russ! I hate being really hungry and not knowing what I want to eat and getting so frustrated that I end up eating nothing at all...this decision may also be impacted by the fact that I haven't had time to visit the grocery in two or more weeks and my microwave has stopped working. I need to remind myself of this more often...and I hate getting to the point where I even need to remind myself of this. Did a law pass that says drivers must go 10 mph under the speed limit on Sundays? My parents come in on Wednesday (Dad) and Thursday (Mom)!!!!!!!!!!! I am a wee bit excited:-) I can't wait to make them proud of me! 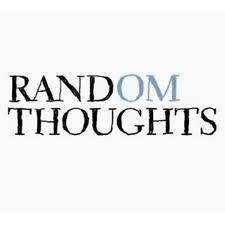 Random thought posts are my favorite! My parents are coming this week, too, and I'm super excited. Good for your dad. My my still calls me every time she gets a pic message on her phone. I have to walk her through the process of opening it. Who's just not that into you? I'll keek them. I love you.